The Penguins have typically struggled against unknown netminders more than might be expected. Tonight was no exception as rookie goaltender Jean-Francois Berube stopped 33 of 34 Pittsburgh shots, but it wasn't enough as Kris Letang scored the lone shootout goal to propel the Penguins to the 2-1 overtime victory. Chris Kunitz had the lone Pens goal in regulation, and Kyle Okposo was the only Islander to score as Marc-Andre Fleury stopped 25 of 26 New York shots to win his 30th game of the season. The win pulled the Penguins to within 3 points of both the Rangers and Islanders, though the Isles have a game in hand, and more importantly the Penguins won 2 wildly different games against both teams in the 2 games since losing Evgeni Malkin for an extended period of time. It was a slow start to the game as the Islanders looked to clog the neutral zone to protect their unproven goaltender, and neither team was able to get much in the way of a quality scoring chance. 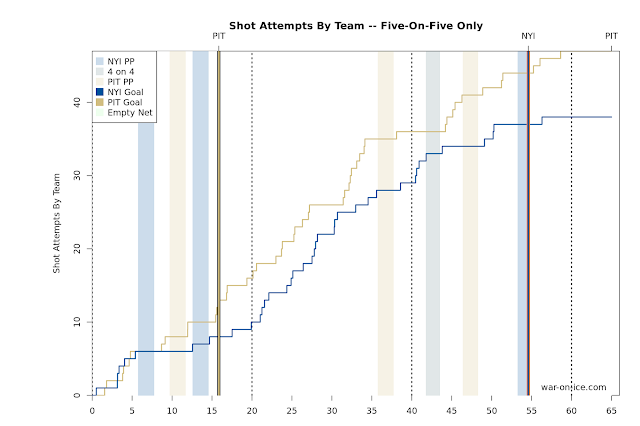 A Sidney Crosby hooking penalty a little under 6 minutes into the game threatened to open things up, but the Islanders never were able to maintain possession in the Penguins' zone, and the best chance of their power play was an Eric Fehr shot from the slot shorthanded. The Penguins started to get more pressure on the Islanders midway through the 1st period, and Tom Kuhnhackl was able to draw a tripping penalty on Brian Strait as he entered the New York zone with speed. The Pens 2nd power play unit, along with newly demoted Phil Kessel, took the ice first, and after not managing much of anything they gave way to the top unit. The 1st power play didn't have much better success, and the Islanders were able to kill off the penalty and get back to even strength, though they quickly went back on the power play when Kuhnhackl took a penalty this time, hooking Kyle Okposo. While the Islanders were able to do a better job holding onto the puck than they did their first opportunity, they still weren't able to get much going. It was crucial for the Penguins to get the opening goal given the Islanders willingness to trap, and with 4 minutes left in the period they were able to do so when Chris Kunitz deflected a Brian Dumoulin wrist shot past Jean-Francois Berube to give Pittsburgh the 1-0 lead and extend Sidney Crosby's point streak to 9 games. The Penguins would take the 1-0 lead into the locker room, but it wouldn't be before Bryan Rust left the game after taking a Johnny Boychuk hipcheck into the boards, though he would return to start the 2nd period. The Penguins had a couple good chances to start the 2nd period. Kuhnhackl had a rebound opportunity on the crease, but he was unable to put it behind Berube. Kunitz was able to make a nifty pass to get Crosby open down the slot with speed on the rush, but Crosby wired the shot into Berube's glove. As important as getting the opening goal was for the Pens, the gameplay throughout the 2nd period began to suggest that it was the 2nd goal that was going to make or break it. The team had a long stretch of puck possession in the offensive zone over halfway through the period, but despite the chances they weren't able to get the next goal up on the board. The gameplay began to pick up towards the end of the 2nd period, but just when New York seemed like they were going to make something happen Thomas Hickey was penalized for tripping Kunitz coming through the neutral zone. The Penguins had trouble getting settled in the Islander zone, and the man advantage expired without Pittsburgh able to get the goal to extend their lead to 2. The teams would go into the second intermission still tied 1-0 and both teams searching for what would be a huge next goal. The teams would play 4-on-4 shortly into the 3rd period as Josh Bailey tripped Trevor Daley in front of the Penguins' net, but the refs quickly whistled the play dead and assessed Daley an embellishment minor as well. The gameplay continued to open up through the period as the Islanders began pressing more to get the tying goal, but another Islander penalty disrupted the flow of the game, and the Pens went back onto the power play when Hickey was called for slashing when he broke Crosby's stick in the corner. As it had on both sides throughout the night, the man advantage favored the penalty kill, and the Islanders kept the deficit to one as the penalty expired. The game would continue to be a tight affair deep into the period, and New York got a big chance to tie things up when Nick Bonino was called for slashing with just under 7 minutes left in regulation. The Penguins would do a good job of disrupting the Islanders' opportunity early, but New York finally got set up in the zone and Okposo was able to grab a rebound and lift it over Marc-Andre Fleury to tie the game 1-1, and things shifted from the Penguins wanting to get the next goal to needing another one to come away with the win. And they nearly got the go-ahead goal with 4 minutes left as a Dumoulin shot from the right point rang off the goal post but deflected harmlessly away. Neither team was able to break the deadlock, and the teams headed to overtime with a big 3rd point up for grabs. It was Berube who got the Islanders to the extra period, and it was Berube who continued to keep New York in the game as the Penguins were unable to solve the rookie goalie despite getting increasing pressure on the Islanders throughout the overtime. The game would go to the shootout, and Berube would need to outduel one of the best shootout goaltenders all-time in Marc-Andre Fleury to take home the victory. He'd stop Crosby on the first attempt, while Fleury would stop Frans Nielsen at the other end. In the second round, Letang was able to roof a backhand over Berube while Fleury stood tall against Okposo's shot. Kessel would wrist a shot into Berube's pads, and the game would come down to John Tavares vs Fleury. Tavares would come in slow, Fleury would miss the poke check, but Tavares would miss five hole and the Penguins would escape with the victory. It wasn't a very fast-paced game in Pittsburgh, but the Penguins managed to come out top in possession by posting a score-adjusted 58.1 CF%. While the Penguins weren't able to prevent the Islanders from leaving with a point, they did manage to pull within striking distance of both New York teams in the Metro, and they increased their lead over the Detroit Red Wings to 3 points for the first wild card. The Penguins will be back in action Thursday night as they'll try to make it 4 wins in a row against the Carolina Hurricanes.